September is national self-care month which aligns nicely with my birthday today when I have plenty of self-care activities scheduled: A massage, a pedicure, a hair appointment, a date night with hubs, a new dress purchase, a glass of wine (or three) and maybe some German chocolate cake to celebrate season 40 episode 4 of my life. Sounds wonderful, right? self-care of self-sabotage? How to tell the difference. Save to your favorite Pinterest board for later. For many of us, self-care means taking time for ourselves, taking a break from the grind, and relaxing. We forget when we’re trying to overachieve at work, run a business, take care of our families, workout, eat right, and have a social life, that it’s ok to give ourselves a break. 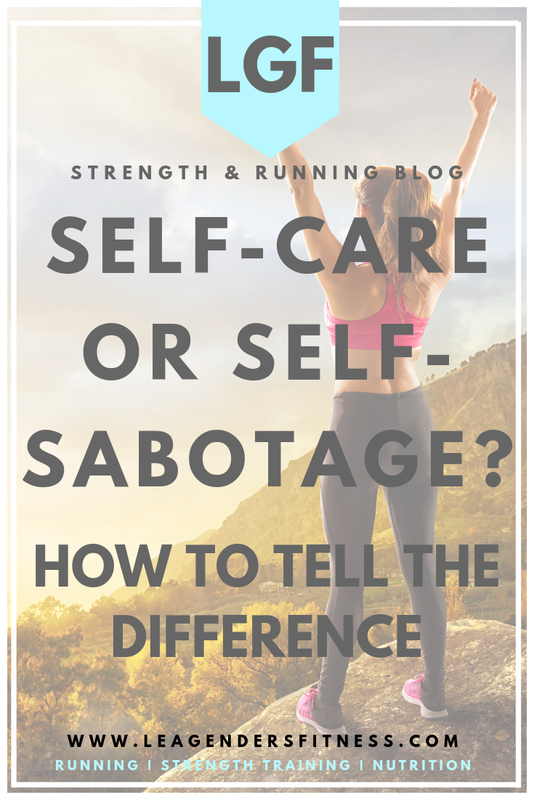 Self-care can easily be manipulated into self-sabotage. Self-sabotage is telling yourself you need a glass of wine after work. Every. Single. Night. Self-sabotage is skipping your marathon training workouts every Sunday in favor of a Netflix marathon. Self-sabotage is ordering take-out because you’re too tired to cook, night after night. It’s giving yourself a break when you’ve had enough breaks. Self-care taken too far becomes self-sabotage. If we’re not taking care of our health, then it’s not self-care anymore. We need to recognize the difference in ourselves between taking care and taking advantage. For some, self-care means taking care of your body by doing that workout. Self-care might be replacing the wine with sparkling water, or taking the time to meal prep on the weekends to make sure healthy meals are available for the busy week. If we are using self-care as an an excuse to not have discipline to do the things that make us healthier, it ceases to be self-care. On the other hand, If we neglect self-care altogether and work ourselves into the ground, that is its own form of self-sabotage. It all comes down to being honest with ourselves. What we do most of the time matters more than what we do occasionally. So if you’re grinding, take a break, relax and enjoy. If you’re letting yourself off the hook too much, then it’s time to get to work.